On any given day, chances are that you will find them together — either in their studio or at home. 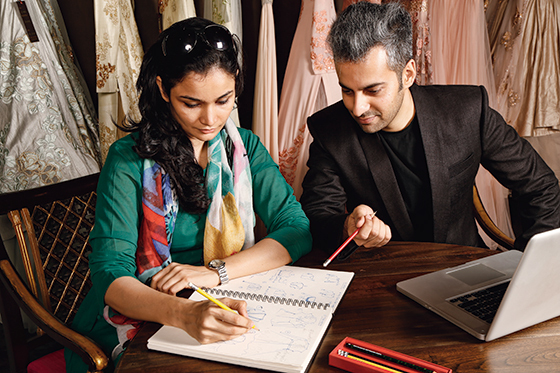 For the Ahmedabad-based designers, who spearhead the brand that bears their names, are tied together by much more than their love for design and fabrics. 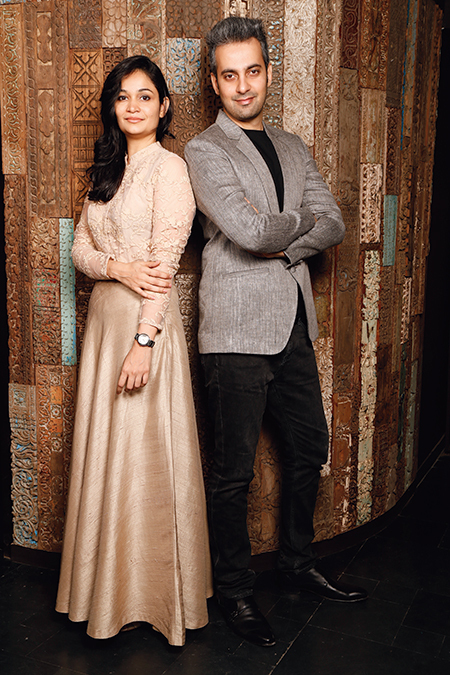 Bhumika and Shyamal Shodhan not only share a working relationship that has spanned years, but they are also a real-life couple with cuts and collections on their minds. Their affinity for fashion was evident while they were growing up. While Bhumika studied fashion at the National Institute of Fashion Technology in Ahmedabad, Shyamal spread his wings and honed his knowledge first at Central Saint Martins in London, later studying Italian design in Milan. They are known for their opulent and intricately embroidered creations and are the first choice of many of the A-listers from Bollywood. Together for 18 years, Bhumika and Shyamal have been married for a dozen. And, having launched Shyamal and Bhumika in 2000, they have carved their own signature style, showing globally and in India. Infused with Indian inspirations, they use artisan techniques and are also passionately involved with the revival of several crafts. After celebrating the first anniversary of their Mumbai store recently, the two took time out to talk about the highs and lows of sharing their personal and professional spaces…. Bhumika: From as far back as I can remember, I designed my own clothes. My mom dabbled in a lot of handloom fabrics and that gave me the liberty to play around with fabric and fashion — and I always felt that whatever I wore had to stand out. Shyamal: I was surrounded by creative people since childhood and also drawn to architecture and interiors. But, it was Bhumika’s admission to NIFT that exposed me to fashion, and we decided to be in it together. What are the other factors that drew you together? Bhumika: We knew of each other since high school and so when we actually met for the first time, it was an instant connect. Besides similar upbringings there was much to share in terms of common creative interests. Shyamal: We are both passionate about creative things and nature, and love to travel. When I saw that at 16, Bhumika designed and created a new outfit for herself every weekend, I was very impressed with her passion for fashion. Was it love at first, second or third sight? Bhumika: (Laughing) For me, it was love at first sight. Shyamal had seen me in school but he always thought of me as a very studious girl with studious friends, if you know what I mean. Shyamal: We met at 17, through mutual friends — it was an instant friendship, followed by love very soon! And our friends complained that they were completely forgotten. How would you define your individual roles at Shyamal and Bhumika? Bhumika: Creatively, we are both equally involved in the design process. I always say that we function like the heart and brain ­— the system doesn’t work normally if both aren’t in sync. But, my work is more about handling the processes. Shyamal: Bhumika is the trained designer and I am the ‘design-preneur’. The workshop was initially set up in her garage and the studio was set up in a corner of my father’s office. So, I styled the clients and customised their outfits while Bhumika designed the lines and executed her vision. What are your individual creative spaces like? Bhumika: Shyamal prefers solitude and quiet spaces, and peaceful times of the day to do his creative work. I can sketch even in chaos, and have gotten used to doodling in the middle of a cacophony of kids playing with Lego or doing their homework. Shyamal: We prefer to work in solitude, wherever we get the space. It could be at our farm or in a quiet area at home or the garden. Our favourite spot to work keeps moving from our bedroom to the living room to the basement of the store or to a corner of the garden. In terms of peak creativity, what is the time that you prefer? Bhumika: My creativity peaks once I am done with the meetings for the day. After two in the afternoon I am free to do my creative work. Shyamal: Late evenings are most creative for me. Mornings are a time to discuss the creative work though. How do you creatively inspire each other? Bhumika: We often discuss new ideas and share different points of view. It’s collaboration in the true sense of the word. Shyamal: We constantly exchange concepts at lightning speed, since we have been in sync for 15 years. Bhumika: We’ve been together for so many years that we now think alike. We have never felt the need to fight to justify an idea. Shyamal: We have never strongly disagreed on anything. What is the advantage of a husband and wife sharing the workspace? Bhumika: I don’t know any other way to do it! The amount of time I have invested in our work would have been impossible to justify to somebody who was not equally committed to the cause. Shyamal: We are never worried about who will take care of our work when one of us is travelling, unwell or busy. We are able to perfectly balance our personal and professional lives. Bhumika: When you enjoy what you do, you don’t feel like you are working. A creative mind can never stick to a time frame, but we do draw a line when discussions spill into our sleep routines. We try to squeeze in every free minute with the kids. Shyamal: Administrative issues are resolved in office hours. Creative issues are resolved at home. And creative discussions have often moved from the boardroom to the dinner table. Our personal and professional lives seamlessly blend in. What do you do when you need your individual space? Shyamal: We build a new home. Bhumika: We have a weekend home in the countryside and we are now constructing a residential building right next to Shyamal’s family home. But we have our areas in the house and in the office which are totally private. In fact, in the home we are building, we have a work floor designed for both of us. Who wields the ruler in the home? Bhumika: We currently live with my in-laws, so I will be able to answer this question only when we move to our own home next year! Shyamal: Just like at work, at home too we take a call on separate things and sometimes both take a call jointly on some issues. But, women are very powerful and they normally end up dominating their men! Creative sparks are bound to fly with two designers around. Who is more patient? Bhumika: While Shyamal is more impatient when thinking about growth, he’s very patient when it comes to creative planning and design inputs, and remarkably patient with clients. They just love him and most of his relationships are for life. Shyamal: (Laughing) We have our mood swings and once I have conveyed my creative vision, I allow Bhumika to completely take over and create the version she wants. My critical comments — after the collection is ready — send her into a wild orbit, so I have to be careful. Who is more hands-on with your two boys? Bhumika: We are both quite involved with the children. Since the store opened last year, Shyamal has been travelling to Mumbai, so he dedicates his Sundays and many afternoons to the children. He plays a lot of sports, from tennis to soccer, while swimming is my domain. Shyamal: Bhumika, as a mother, has always felt guilty that she’s unable to give enough time to the kids. She’s definitely the more hands-on parent. Since we have boys I take care of the outdoor activities, and a bit of the homework too. What is the one thing that both of you appreciate about each other? Bhumika: His vision, enthusiasm and people skills. Shyamal: Her creative talent, relationship with our craftsmen, superhuman execution skills and her hard-working nature. Is there anything about each other that you would like to change? Bhumika: We are constantly changing; our perception of things has matured as we have grown older. Shyamal: Earlier, Bhumika would get into every small detail and spend too much time in the workshops. It became a nine-to-nine thing for her. I wanted to change that because it was a strain on her physically. Now that the kids are in the picture, I am happy that she runs home almost Cinderella-like the moment it strikes three!